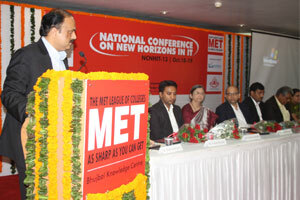 MET Institute of Computer Science organised the National Conference on New Horizons in IT on October 18 -19, 2013. The speed of growth in IT is so rapid that the span between two innovations has shrunk considerably. It is the need of the hour to be constantly alert and take stock of research in the IT field.